At CAQ AG we provide highly renowned and award-winning support. The unparalleled commitment and passion of our support-team has, over the years, continuously set the benchmark for support-services in the industry. Our team consists of highly-trained IT-professionals, who command years of experience in dealing with the most diverse systems and interfaces. So, whether you contact us via our web-based service-portal or via our hotline, rest assured that you will always receive consistently effective and efficient support in all matters relating to CAQ and beyond. Not least thanks to the many enquiries, wishes, and suggestions that are made by our customers and the ensuing input we gain regarding the practical implementation of our solutions in a variety of industries, we are able to continuously develop our modules further and perfect their usability and scope of function. We pass on these improvements and enhancements directly to all our TSP-customers in shape of new updates and releases, which are made available within short intervals of just a few months – completely free of any additional charge. Our customers can then conveniently download and install these new releases and updates themselves – no further costs for additional services involved here either. CAQ.Net® is validated, compliant, and always up-to-date. Our entire software family undergoes frequent validation processes in order to certify the flawless conformity of your management system with pertinent regulations. This gives you exceptional investment protection because you can always rest assured that you are applying the most current standards and regulations within your daily quality management processes. The majority of software maintenance contracts on the market only cover the technical parameters of the product. Hence, in these cases, one of the most important factors is sorely neglected: the everyday user. The fixation on technical aspects displaces the component of human interaction with the software. This is why we at CAQ AG not only take care that your software’s technical parameters are always up-to-date and fully functional, but also that your employees who use the software on a daily basis are perfectly trained: we regard the professional training of your employees as an integral part of our service promise. 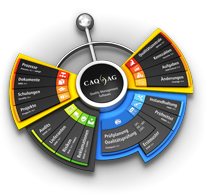 You as TSP-customer are therefore entitled to free attendance of CAQ software user workshops executed by GFQ Akademie GmbH, as up to 25% of the annual TSP fee is 100% credited towards the course fees for all CAQ user workshops. A tool can only function optimally if it is placed in skilled hands. In order to help ensure that your employees are skilled in all QM-relevant matters even beyond the operation of your CAQ-system, you as TSP-customer generally receive a special 10% discount for participation in all public seminars and courses executed by GFQ Akademie GmbH. TSP-Premium provides you with the opportunity of supplementing your Top Service Pack with a fixed number of service days. * It enables you to purchase service days in advance at a heavily discounted rate and furthermore achieve comprehensive security of planning. TSP-Premium is probably the most unbureaucratic and efficient way of ordering services, as all you need to do if you require a service day, is make one phone call. The service days included in TSP-Premium can, for instance, be used for onsite-trainings, in-depth consulting, or onsite assistance during system expansions. All of these services can also be utilized in shape of remote-sessions (e.g. via TeamViewer®). Our online-service-portal provides assistance as well as additional helpful information and is always there for you when you need it. Depending on the level of service you order, we also provide a 24/7 emergency hotline for rapidly dealing with issues relating to your CAQ-system at any time of the day or day of the week.